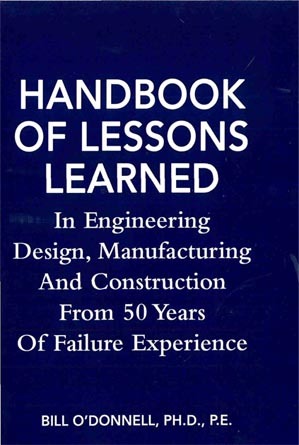 Book Release - Handbook of Lessons Learned in Engineering – O'Donnell Consulting Engineers, Inc.
Bill O’Donnell, Sr., recently published “Handbook of Lessons Learned In Engineering, Design, Manufacturing and Construction.” It is intended for engineers, designers, manufacturers and constructors – depicting failures from thermal, structural, vibration, corrosion and other failure mechanisms. Read a sample of this book, Section 1 Designers’ Lessons. This book is now available for purchase on our website. Or, you can order it through Amazon.com.